Academic Executive Director of the LAU New York Academic Center takes part in “MENA Emerging: Resilience Amidst Uncertainty” conference. Lina Beydoun (second from right) participated in the conference, speaking in a panel on youth and unemployment. 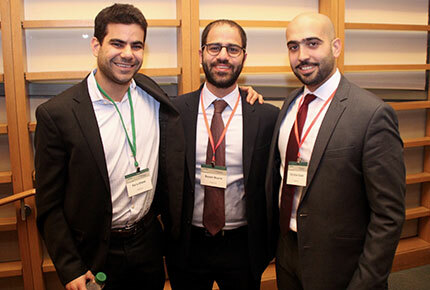 Christian Oussi Jr. (right) with fellow M.B.A. students and conference organizers at the Wharton MENA Conference. Lina Beydoun, academic executive director of the LAU New York Academic Center, joined prominent practitioners, thought leaders, academics and entrepreneurs at the Wharton School of Business in a discussion about the latest developments and trends in fields like energy, entrepreneurship, real estate, and healthcare. Beydoun was invited to speak in a panel on “Youth and Employment.” She touted the region’s prospects, stating that vast numbers of young people coming into adulthood will mean an unprecedented talent pool to create and innovate. While the MENA region continues to show staggering youth unemployment rates, experts say a lack of education is not the issue. Instead, they highlight various other factors that include a competitive job market where youth lack the skills in demand― often referred to as a “skills mismatch”― an over-reliance on family connections to get jobs, and a lack of opportunities in a thriving private sector, to name a few. Along with other American universities in the region such as AUB and AUC, LAU is paving way for youth employment and working to bridge that skills mismatch. According to a recent study by the Adnan Kassar School of Business, 78% of its graduates were employed after graduation. However, said Beydoun, prospects for youth employment across the MENA region are handicapped by a glaring gender gap ― 13 of the 15 countries with the lowest rates of women participating in their labor force are in the MENA region, according to the 2015 Global Gender Gap Report ― and the current economic and political turmoil which, accompanied by the recent decline in oil prices, has deterred international investors. 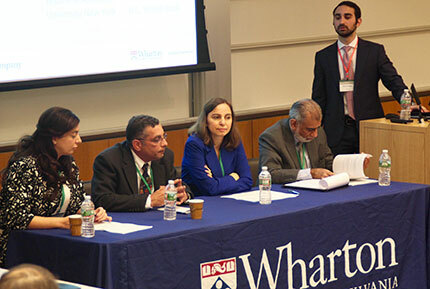 Organized entirely by Wharton students, the conference provided a glimpse of the prospects for the region from those who are deeply involved in the local economic, political, and social systems. Speakers echoed that positive note, and were united in the belief that the current instability is laying the groundwork for future positive transformation. The 150 participants included students from leading U.S. universities, including Penn, Columbia, Duke, George Washington, Harvard, Johns Hopkins, and Penn State, who plan to connect their careers to the region.